Highlights: A day on Junior�s glass-bottomed boat. Junior took us snorkelling at Little Bay � just as wonderful as we remember, but a little more crowded, with 5 boats there during our 1 � hour stay. It was our 8 year old�s first time snorkeling and, once she was comfortable there, Junior took us to a reef off Upper Shoal Bay that was just beautiful. After exploring there for a while we travelled along the shoreline and then over to Scrub Island. We took a jeep tour of the island, saw the hot baths, abandoned airstrip and hotel, and plane crash site. Then it was back to Shoal Bay East. We ended the day exhausted, happy, and a bit sunburned! Junior has a wonderful way with kids. My son spent the rest of the trip trying to figure out a way to get Junior to come visit us in NH. Welcome to a whole new underwater world of adventure in the tranquil waters of our beautiful coral island, Anguilla. Have your ever seen a trigger fish, a greenback turtle, or a live giant coral? Experience sea life in its natural state when you go out on Captain Junior Fleming's new glass bottom boat, complete with shady canopy and chilled soft drinks. Just show up at Shoal Bay East and ask for Junior or call 264-235-1008 for a reservation. These services come to US$40-$80 per person per hour. Children seven years and under are free. Or, make an appointment to have Junior teach your entire family to snorkel comfortably and safely, including people who cannot swim. He does dry land training with the mask, then instruction in the pool or shallow water, and finally reef diving. The use of life jackets and easy learning steps makes it possible for even the most nervous person to learn to enjoy the quiet beauty of the ocean under their own control. Come back the next day to go "trawling" for Tuna and King Mackerel or "bottom fish" for Red Snapper or snorkeling at incredible Little Bay. Even charter the glass bottom boat for the whole day and explore Anguilla in depth. Junior operates his boat Sunday through Friday, 8 AM to 5 PM. Taxi service can be arranged from any of the hotels on Anguilla. Just call 264-235-1008 to arrange everything for your underwater adventure. 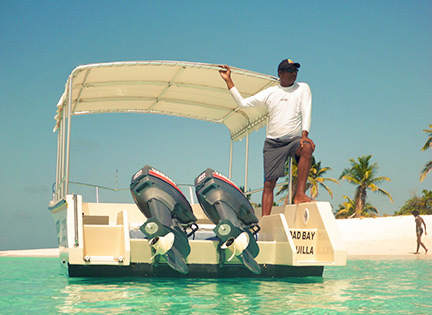 Junior Fleming has over 20 years experience in glass bottom boats on Anguilla. Before he built his own boat, he captained Mike's glass bottom boat and Harry's too. Junior's new boat incorporates all his years of experience--the stern of the boat is lower and has steps for easy boarding. Junior is definitely the skipper that knows the hidden spots in the reef. 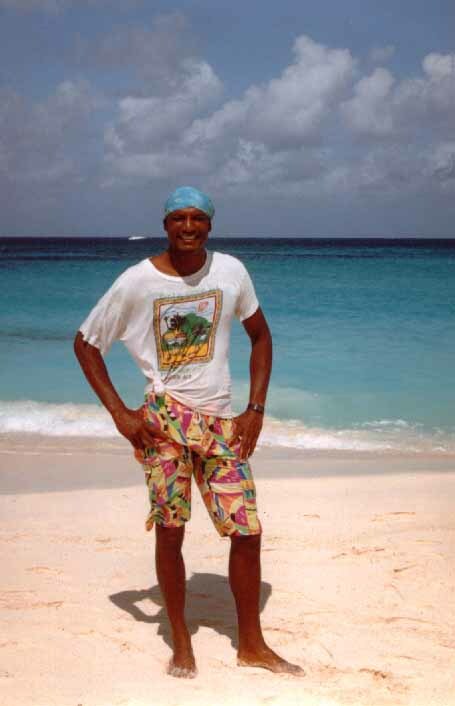 You may recognize Junior from previous trips to Anguilla: check out a full-size photo. For an underwater photo tour of the tropical fish you will see when you snorkel Anguilla, visit this site. Anguilla News (News.ai) -- the "little things that make Anguilla, Anguilla." Finally, want to go diving? Here is some excellent information on Anguilla diving.